The names of Chicago’s public institutions and infrastructure bear the names of its founders and pioneers, honoring their contribution to the city’s development. These represent what we as a city place value on in our collective history. They tell us about who we are as Chicagoans and what kind of place we live in. One contribution that is less recognized is how these streets got here in the first place. Chicago’s grid system is a product of city planning. but the original of its radial streets is far more human and organic. Similarly, Chicago’s canals are touted as feats of American ingenuity, but the history of these infrastructures shows that even before their construction the functions they served were nothing new. Much of early American history discusses the discovery of the continent, and how knowledge of its natural features were illuminated to European explorers. But the story of discovery in the Americas is at the same time the story of knowledge transfer from indigenous peoples to colonizing ones. This is the story of Chicago’s founding and how Indian infrastructure and knowledge of the land produced the city we know today. 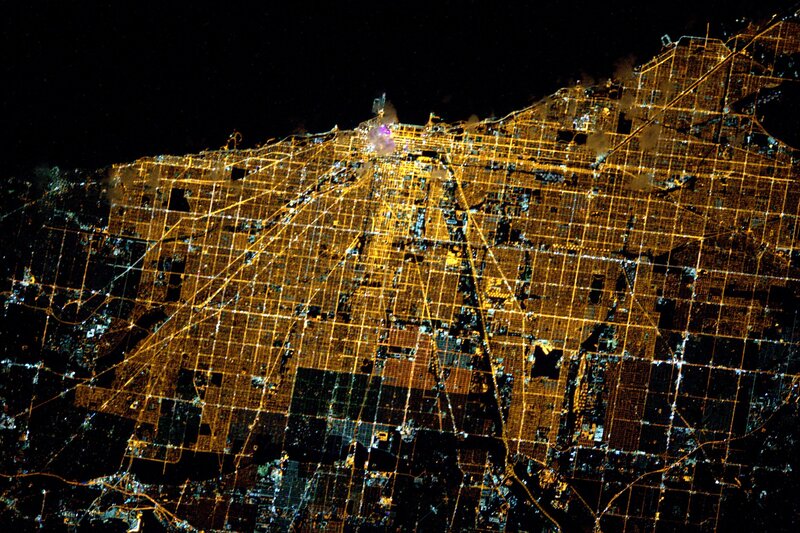 Chicago’s grid system and radial streets as seen from the International Space Station. The story of Chicago’s transformation into metropolis of the Midwest begins with Jean Baptiste Point du Sable. Not much is known about DuSable’s background. He was of African descent, believed to have been born in the French colony of Saint-Domingue in modern-day Haiti. In 1788 he was documented marrying a Potawatomi woman named Kitihawa (Christianized as Catherine) in Cahokia. Sometime in the 1780s he settled by the mouth of the Chicago River along the crossroads of several Indian trading routes. For having established the first permanent settlement at this site, he is often credited as the founder of Chicago. His was no average log cabin. Besides the house, the property’s bill of sale is quoted as having two barns, a horse-drawn mill, a poultry house, a bakehouse, a smokehouse, and even a dairy. DuSable’s success as a trader can be attributed to spatial linkages that express themselves both culturally and geographically. Such linkages allowed for the flow of knowledge and commodities across peoples and cultures. The same factors that made DuSable’s trading post prosperous were ultimately what made Chicago the global city it is today. 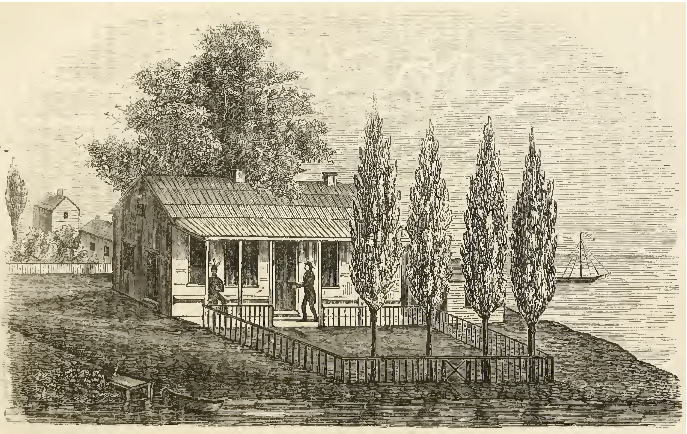 Illustration of DuSable’s home and property from the early 1800s, after its sale to John Kinzie. The first of these linkages for DuSable was cultural, and had already been made a decade earlier. Sometimes geographies are better expressed in terms of cultural terms, in notions of closeness rather than measured distance. Trade is an endeavor based on mutual trust, and as tolerant as the Potawatomi were, they refused to trade with strangers for this reason. There was a certain spatiality to this. The neighboring Haudenosaunee (Iroquois) and Dakota nations were not Algonquian-speaking peoples, not kin, and therefore not trustworthy trading parters. Though still relatively close in distance, topologically they were considered as distant from the social structures of the Potawatomi as the Europeans. To access Indian trade networks, any outsider would have to become close, linking themselves to the tribe in the traditional way – through marriage. DuSable was certainly aware of this, and was likely the rationale for his wedding to Kitihara. By marrying into the Potawatomi he had gained their trust, their potential trade connections, and access to their knowledge of the land – their geographies. 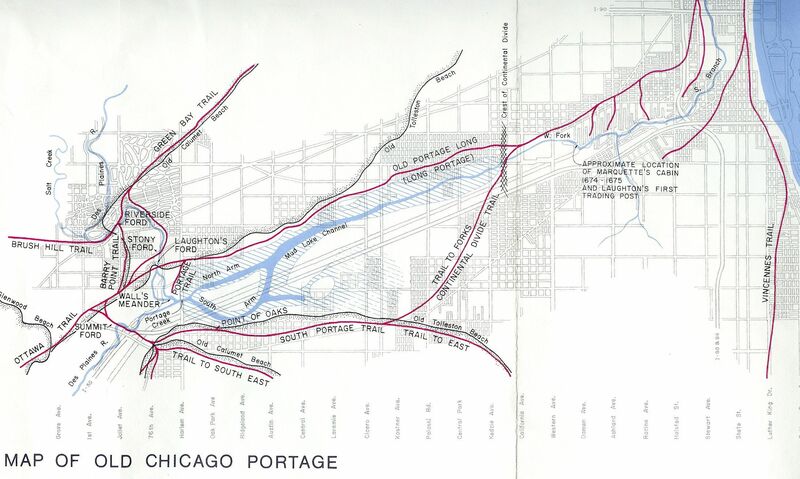 DuSable capitalized on this by establishing his trading post at the intersection of two systems: the network of Indian trade routes, and the Chicago Portage. These natural systems, combined with indigenous knowledge acquired and passed down through generations, constituted nothing less than the economic infrastructure of the pre-European Americas. For centuries, the strong indigenous economy produced and reproduced the walking trails that connected villages throughout the region. The trail network was extensive, and not fully visualized until mapped in 1900 by Albert Scharf. 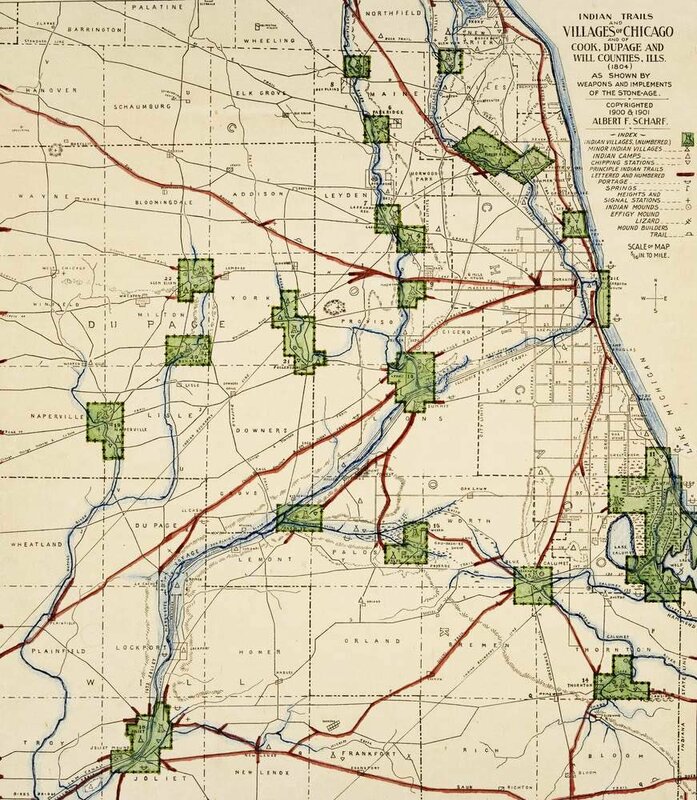 His map approximates the former Indian villages, trails, and other infrastructure that existed in Cook and surrounding counties a century earlier, comparing them to the familiar street grid that developed as Chicago did. What is remarkable is the amount of overlap between the two. Clark, Lincoln, Elston, Ogden – these major streets and others follow same routes that once connected hundreds of indigenous communities. In a way, the production of the trail network can be used as a metaphor for indigenous collective learning. Just as the steps of each generation reenforced the earthen paths their ancestors used to carry goods throughout, knowledge of the land was acquired over successive lifetimes and amplified over generations, passed down through the mediums of language and an oral culture. The result was a wealth of geographic and biological knowledge that animated the land’s features and made them usable for human interests. This included an advanced understanding of agriculture, employing slash-and-burn methods for clearing farmland and polyculture in the form of the Three Sisters. The former was used to create arable land for farming, which the village would live off of for a few years at a time before relocating. Often overlooked as a factor in American history, American Indian cultivation practices were largely why European colonizers stumbled upon a continent as arable as it was. The latter was a cultivation method for beans, squash, and maize, in which each helps the other members of the ecosystem. The cornstalk provides structure for the traveling beans, and the squash provides cover for the soil. This innovative method was not developed by the Potawatomi, nor by any Algonquian-speaking people. Maize is not even native to the Great Lakes region; it was actually domesticated in southern Mexico. Could this grain really have made it all the way across a whole continent on foot? In Chicago: A Food Biography, local professors Daniel Block and Howard Rosing write “indigenous processes of transforming local flora and fauna into food and other resources such as clothing and housing depended on this transportation infrastructure for cross-fertilization of knowledge.” The appearance of maize in the Potawatomi diet, as well as the prevalence of the Three Sisters technique, are testaments to the effectiveness of pre-contact North American trade networks and their ability to disseminate information. But above all, it was their knowledge of one local water feature that changed the role of Chicago as a city. The Chicago Portage was unknown to Europeans until 1673, when fur trader Louis Jolliet and Father Jacques Marquette embarked on an expedition to locate the Mississippi River. Marquette, fluent in six American Indian languages, and Jolliet, explorer and cartographer, had heard rumors of the river and its importance from local Indians. With patronage from the governor of New France, they departed from Michigan’s upper peninsula for Green Bay and canoed up the Fox River. From there they had to portage, or walk their canoes over land, for about two miles to reach the Mississippi River. Their expedition would map much of the upper Mississippi and confirm that it did indeed flow into the Gulf of Mexico. But the greatest knowledge they would bring back was not be discovered by them, but by the Potawatomi and Algonquian-speaking peoples they would meet on their return. 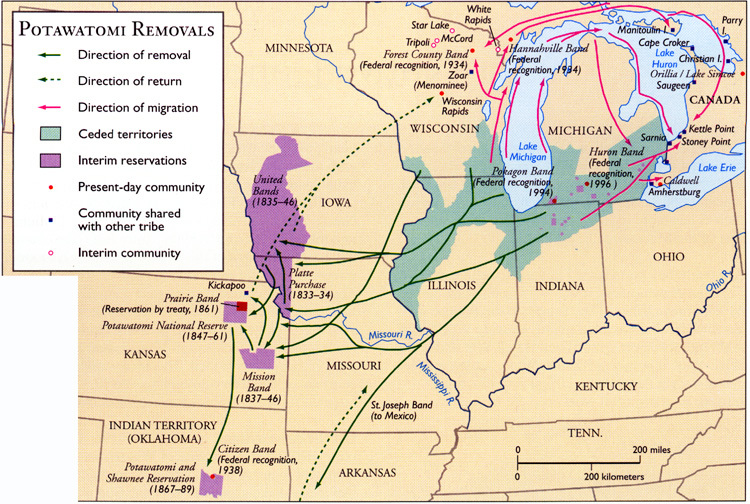 It was as Jolliet and Marquette were returning North up the Mississippi that they heard of a shortcut back to the Great Lakes from local Indians, likely Potawatomi or Illiniwek. It was another place to portage, this time from the Des Plaines River through a marsh known as Mud Lake to reach a river that drains into Lake Michigan. That river was the Chicago. By crossing from the Mississippi River to Lake Michigan, the two Frenchmen had become the first Europeans to traverse the Chicago Portage. From a European perspective, the implications of this were enormous. North America’s two largest systems of navigable waterways could be connected by a distance of only eight miles! The economic opportunities posed by this linkage were too great to be ignored, and were quickly noticed by colonial powers. 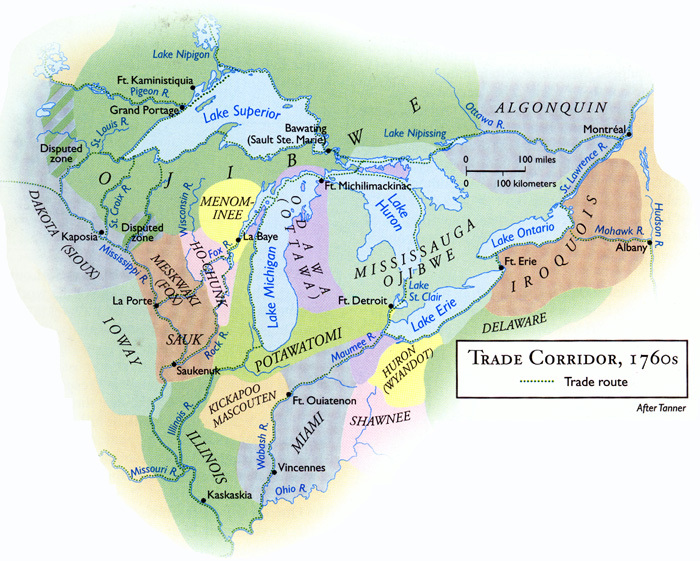 Jolliet noted upon his return to New France the possibilities the portage presented for empire, with control at both ends at New Orleans and Quebec. In subsequent decades, the French, British, and Americans would fight over the land and each hold it for some time. This would spell disaster for Chicago’s earliest residents. In 1779, DuSable was arrested by the British for his French and American sympathies. He would be forced to work for them at a trading post in Michigan until his release about four years later. When he returned to Chicago, he found his settlement had grown to become a significant regional trade and transit hub. The Mississippi and the Great Lakes were finally connected in 1848 upon the completion of the Illinois and Michigan Canal. Its opening marked the beginning of a new period in American history, with the city of Chicago at its economic center. But those whose knowledge made such a work possible were those who shared its economic benefits the least. By that time the Potawatomi had been unfairly negotiated into reservations, had the size of those reservations reduced, and many were forced to march over 600 miles under threat of violence to reservations in Nebraska or Kansas. Today, this is known as the Potawatomi Trail of Death. Chicago is unique in so many ways, but it’s transit networks and water features have guided its development more than any other. Neither of these infrastructures would be possible today without the contributions of the American Indians who illuminated their presence to early explorers. So next time you find yourself at one of Chicago’s wacky six-way intersections, take a moment to appreciate it. Not for the names on the signs, but for the feet that once stood where yours are now, the people who carved the road out through generations of use, living their lives in a complex social hierarchy with an strong local economy. Let us remember that in those diagonal streets lies the organic skeleton of a city we inherited from those who once lived here, and how in many ways, Chicago was founded long before the settlement of Jean Baptiste Point du Sable.